A witty, off-beat exploration of an eternal romance in the modern world. I’ve intently followed director Jim Jarmusch’s 30+ year film career since first seeing ‘Mystery Train’ back in 1989. And 2013’s ‘Only Lovers Left Alive‘ stands as one of his best. Lovingly showcasing a handful of immortals just talking about ideas, music, and their lives together (and apart) over the millennium. If you’re seeking frenetic “vampire action”, grotesque horror, and/or sappy melodrama I’m happy to disappoint you. Adam (Tom Hiddleston, stellar) is bored and depressed. Spending his endless days writing and playing (mostly funeral) music in a rundown old house at the edge of Detroit. His only contact with the outside world is rare musical instrument procurer Ian (an entrepreneurial hippy Anton Yelchin) and the occasional phone call with his estranged wife Eve (a smoldering, brilliant Tilda Swinton) who’s currently “living” in Tangiers, Morocco. Adam’s just looking for any excuse to end his long-suffering life. Thousands of miles away, Eve, by contrast, is a much different creature. She sees eternal life as a blessing–pursuing new ideas, new music, new anything. There she’s in close contact with her guru Christopher Marlowe (a devilish John Hurt)–the playwright who wrote ‘Hamlet’ and ‘Romeo and Juliet’. Only the “other guy” took all the credit as Marlowe was dead–and a vampire. Turns out that wooden stakes, garlic, holy water, and decapitations are no longer a vampire’s biggest concern. Humans (aptly called “zombies”) have completely contaminated the blood supply. If an immortal drinks “a bad batch” it could possibly kill them (for real this time). Where Eve relies on Marlowe for the “good stuff”, Adam depends on a local blood bank “supplier” portrayed by a wonderfully goofy Jeffery Wright. After returning to Detroit to “save” her suicidal husband, Eve and Adam embark on a week-long adventure. Two wizened vampires reconnecting and enjoying each other’s company for the first time in decades. Soon Eve’s wild “sister” Ava (Mia Wasikowska) shows up and turns their lives undeads(?) upside down. Apparently, if you’re turned as a teenager, forever you’ll remain a teenager…Awesome sauce! Youth run amok in a vampire story is never a good idea. 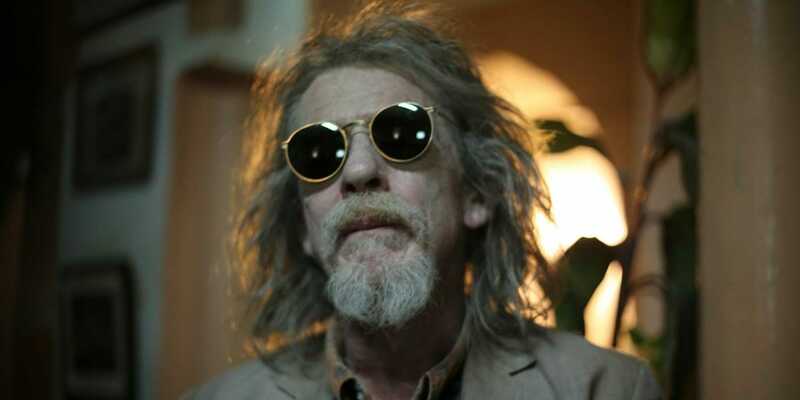 Christopher Marlowe (John Hurt) is forever cool. 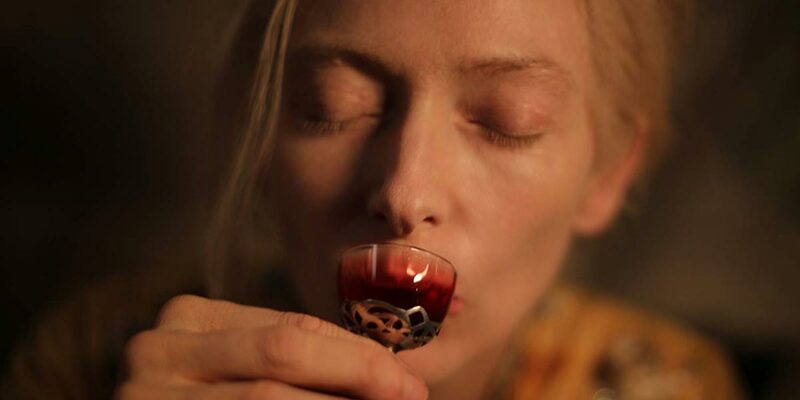 Eve (Tilda Swinton) will only drink the “good stuff”. Not much of anything exciting happens, however, I was never once bored. Hiddleston and Swinton’s steamy chemistry, piercing pathos, and an abundance of dark humor ensure rapt attention. When producers asked the auteur Jarmusch to expand upon what limited action there was, Jarmusch–in snarky response–removed it entirely. F*ck You, Hollywood! Eve and Adam have multiple lifetimes experiencing history, culture, literature, and music; their conversations are endlessly compelling and deep-dive resonate. Haven’t had this much fun deciphering a film’s in-jokes in a long while. “She’s going to be famous.” “I hope not. She’s too good to be famous.” And the R&B peppered eclectic soundtrack is a wondrous delight that acts a motif in bonding these centuries old characters together. ‘Only Lovers Left Alive‘ is one of Jim Jarmusch’s most accessible films. A simple, exquisitely layered, and boundlessly entertaining and passionate tale of two vampires riding the wave of immortality the best they can. With two stellar, steamy lead performers, quirky black humor, intimate global settings, and reflective drama you just can’t look away. Action be damned–this is how you tell a vampire story.